Please visit this site on a desktop computer. * This website is made with Webflow and is a demo on how to set a cookie using Jquery, and use it to show a popup message or not. If you haven't seen a popup when loading this site, it's because the cookie is already set and active. Load this site in an Incognito window (private session) or clear your cookies, to load the popup again. When this page loads, a script checks if a valid cookie named “alert” already exists. 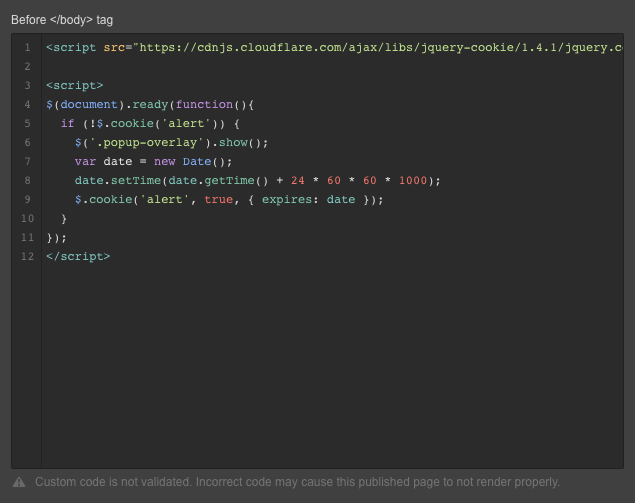 If there is a valid cookie, the script does nothing. If there is no such cookie, the script then adds a cookie named “alert” automatically, and shows a hidden element (the popup) with the class .popup-overlay by giving it the CSS property display:block. In the script, you only need to make sure that .popup-overlay reflects the class name of the element you need to show when no cookie is found. In your page, once you have designed the popup element, give it display:none. The scripts must be placed in the Before /body custom code field, in the page settings panel. To easily test your work with cookies, use a private session widow in your browser. The cookies are set for one session. Every time you close a session and open a new one, you start over and the popup shows up. Preheat oven to 350 degrees F (175 degrees C). Cream together the butter, white sugar, and brown sugar until smooth. Beat in the eggs one at a time, then stir in the vanilla. Dissolve baking soda in hot water. Add to batter along with salt. Stir in flour, chocolate chips, and nuts. Drop by large spoonfuls onto ungreased pans. Set the oven to 350 degrees F (175 degrees C). Sift together the flour and baking soda, set aside. In a large bowl, cream together the butter, brown sugar, and white sugar. Beat in the instant pudding mix until blended. Stir in the eggs and vanilla. Blend in the flour mixture. Finally, stir in the chocolate chips and nuts. Drop cookies by rounded spoonfuls onto ungreased cookie sheets. Oven to 375 degrees F first (190 degrees C). Sift together the flour, salt and baking soda; set aside. Cream together the butter, sugar, peanut butter and brown sugar until fluffy. Beat in the egg, vanilla and milk. Add the flour mixture; mix well. Shape into 40 balls and place each into an ungreased mini muffin pan. First sift flour, baking powder, and salt together, set aside. In a large bowl, cream together the margarine and sugar until light and fluffy. Beat in the eggs one at a time, then stir in the vanilla. Gradually blend in the sifted ingredients until fully absorbed. Cover dough, and chill for 2 hours. Find more HTML/CSS tips & tricks and turorials on inb4, my blog aboutWebflow.